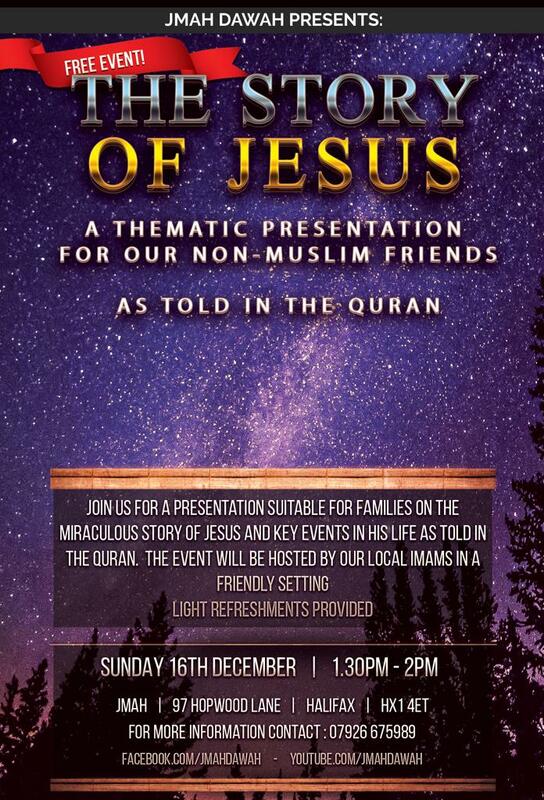 Jimah Dawah Mosque is presenting a family event for people of all faiths or none to describe how Jesus and the key events in his life are described in the Quran. The event will be hosted by local Imams at the JMAH at 97 Hopwood Lane, Halifax HX1 4ET on Sunday 16 December, 1:30pm-2:00pm. Light refreshments will be provided and all are welcome. For further information call 07926 675989. This entry was posted in Dec, Events and tagged Calderdale Council, Cohesion & Equality Officer (Hate Crime Reduction), JMAH DAWAH.